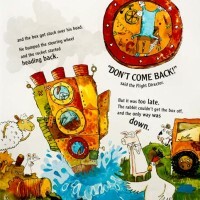 They could take no more of his environmental destruction and their mistreatment, but who could have guessed that the animals on Mr Tanner’s farm would take action! 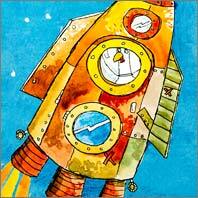 While selfish Mr Tanner was busy polluting the air with smoke, filling the river with muck and junk, and cutting down the trees, they set about building an intergalactic rocket to escape to the clean, clear stars. 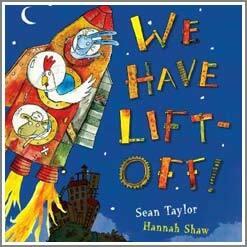 Narrated by the ‘first chicken into outer space’ this hilarious story follows the efforts of the farmyard animals and their series of disastrous test flights. 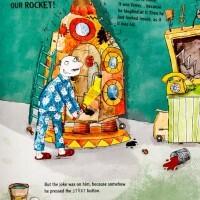 Pig designed the rocket, chicken was given moonboots and a life’s supply of cornflakes. It was very simple…The green button was to start the rocket and the red one (which was not to be pushed except in an emergency) was the ’emergency abandon mission’ button. So full of hope, so close to success, but chicken was holding the map upside down! “DON’T COME BACK” said the flight director but it was too late. The first of many rocket tests crashed back to earth. From the goldfish bowl helmets to rocket cams receiving via fork, this mad cap adventure never lets up. The pictures are full of quirky details that will intrigue and bemuse. The colours are rich and exciting but never garish. 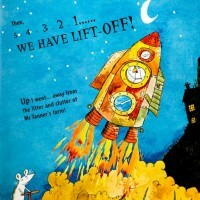 There are wonderful repetitions of 5-4-3-2-1..WE HAVE LIFT OFF! to be chorused as each successive mission is launched and the inevitable “DON’T COME BACK!” as each animal bungles the flight. 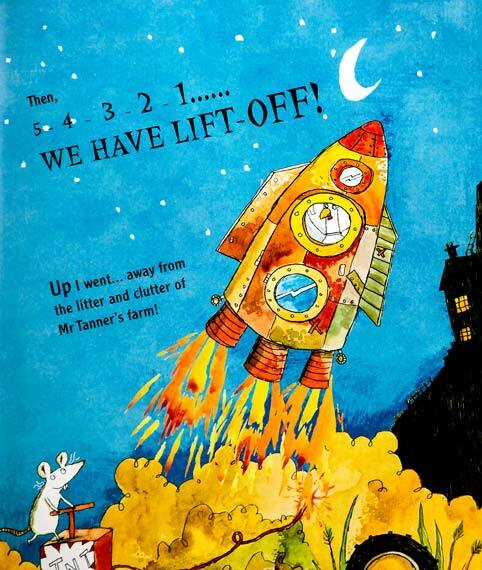 The ending is a triumph of chance as Mr Tanner finds the rocket one night and pushes the start button. 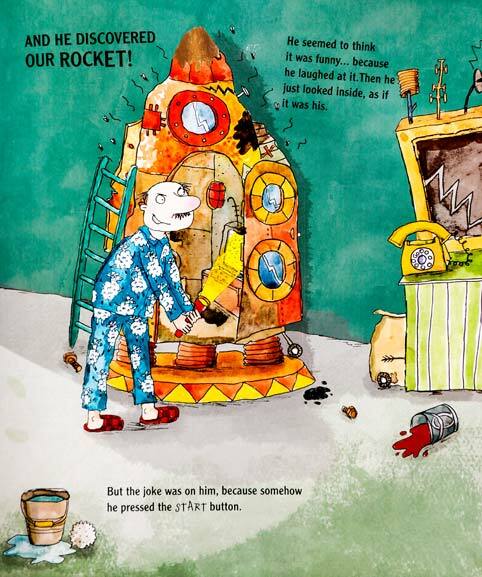 He was never seen again and as fame of their unwitting success spreads, animals around the world began building intergalactic rockets to send other people who make a mess of our planet out into the stars! 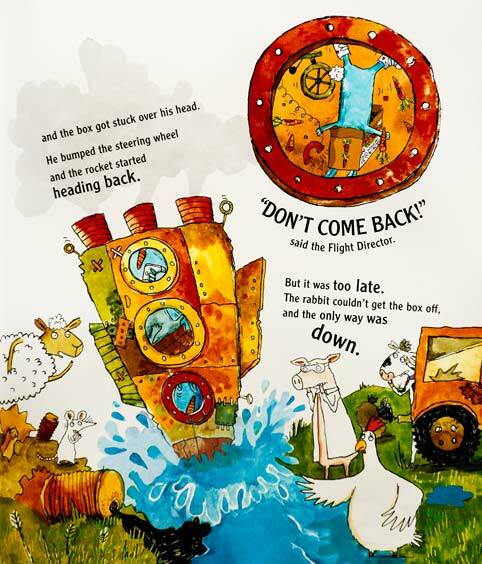 This wonderful action packed cautionary tale, is both a shining light in the crusade to encourage environmental awareness and a glimmer of hope for the millions of animals who are stuck on farms just like Mr Tanners!